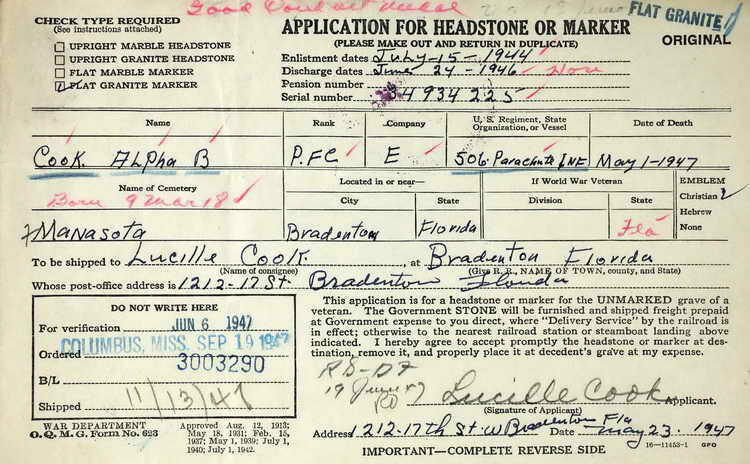 Application For Headstone and resulting grave marker for Alpha B. Cook in Manasota* Memorial Park, Bradenton (Manatee county), Florida. 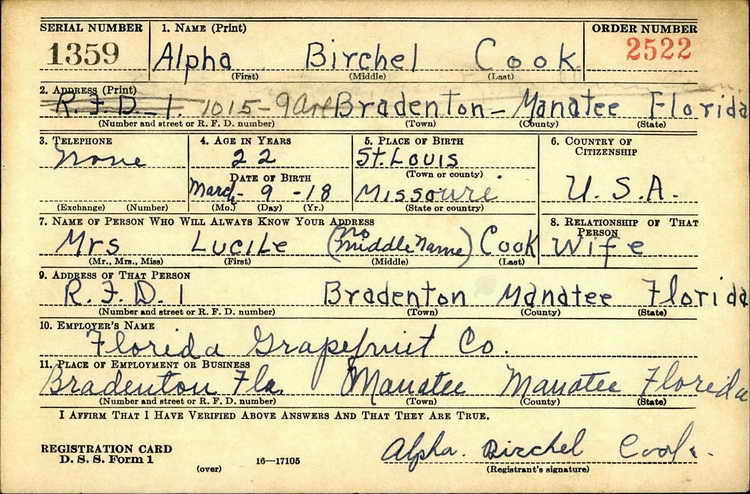 Alpha married Lucille Warren in Manatee county, FL on 26 January 1940. It is she who signed the application for Alpha's headstone. Less than 9 months after his marriage, on 18 October, 1940 Alpha registered for the draft. Even though 200,000 men were drafted per month, nation-wide, Alpha's name didn't come up for another two years. He was called to duty on 21 July 1944 and was inducted at Camp Blanding, FL. He was employed by the Florida Grapefruit Company when he registered for the draft but at the time of his enlistment his occupation was stated as a welder. That may or may not have been with the citrus fruit company. Pvt Cook was transferred from the 101st Airborne Division to Company E, 508th PIR on 23 October 1945. A news article in the Tampa Bay Times, St. Petersburg, FL, on 03 May 1947, listed him with others who had recently been admitted to the Bay Pines Veterans Hospital in Bay Pines, FL. No other information was given. However, Alpha had died shortly after being admitted. No obituary has been located.